The Men's Bible Study meets on Saturday mornings at 9:00am in Luther Hall and will conclude for the Spring on May 18. There will be various events – fishing, golfing, grilling, etc. – throughout the summer months so stay tuned to the Church & Men’s Ministry E-Blats and the St. Matthew Website for updates. Sundays at 9:30 a.m. in the north end of Krueger Hall . EVERY ONE HIS WITNESS, this study will start April 28 and run thru June 2. The Adult Discipleship Class meets Sunday Mornings during the Education Hour, 9:20-10:20 a.m. in the Upper Level Conference Room. The Adult Discipleship Class is offered for those who desire to become members of the congregation and for those who would like to review the basics of Biblical Christian teaching from the Lutheran perspective. The next class will be in the Fall of 2019. 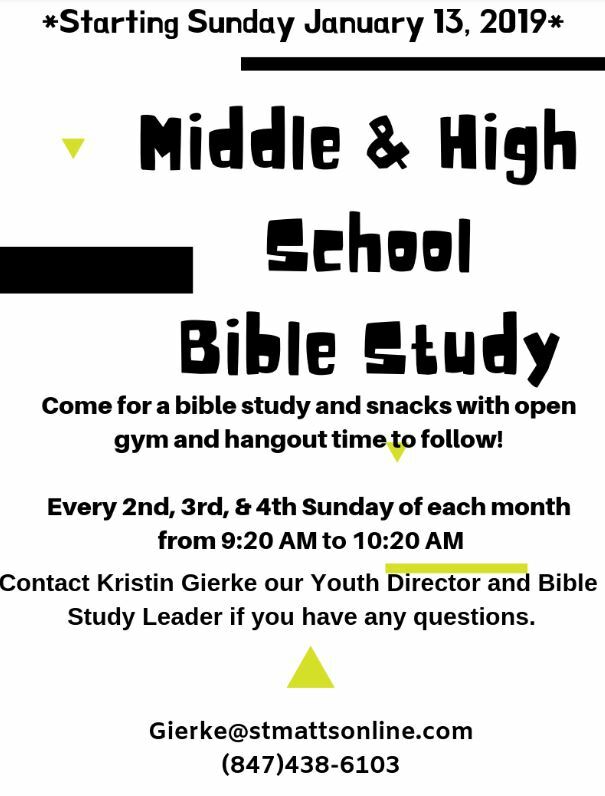 This new Bible Study will meet every 2nd, 3rd, & 4th Sunday of each month from 9:20am-10:20am in the school gym. Final class is May 26, 2019. Classes will resume Fall of 2019. The group meets on the 1st and 3rd Thursday of each month from 10:00-11:00am at Saddlebrook Farms in Grayslake, IL. THE YOUTH CONFIRMATION MINISTRY will kick off new classes in August 2019, 6:30p.m.-7:45p.m. Pre-Confirmation Classes are held on Sunday's at 9:20am. THE YOUTH CONFIRMATION MINISTRY of St. Matthew Lutheran Church, Hawthorn Woods is currently on a four-year schedule which normally will include 5th, 6th, 7th and 8th grades. The Pre-Confirmation course is expected of all students in grade 5. The three years of Confirmation instruction include Year 1 (grade 6); Year 2 (grade 7); and Year 3 (grade 8). The purpose of the instruction is to help baptized Christians identify with the ministry and mission of the church. It is also a way for Christians to learn more about their Lord and Savior, Jesus Christ, and to develop a more personal relationship with Him that is intended to last a lifetime. Classes begin in August and run through May. 1st, 2nd, & 3rd year classes are held on Sunday's at 6:30p.m.-7:45p.m. Pre-Confirmation are held on Sunday's 9:20 a.m.
“Who is Jesus According to Jesus” bible study is held on Monday's at 9:30am & 7:00pm in Luther Hall. Visit www.LutheranChurchCharities.org for more information. Our topic is: “Our Hope & Our Future: A Study of Jeremiah”. We meet on Tuesday evenings at 7:00pm in Luther Hall. All women are invited to join us. All women are invited to join us at 7:00 in Luther Hall. For more information or questions, contact Nancy Blonski at home at 847-847-1945 or @ blonski@truemen.org. Men's Bible Study that meets on Thursday's at 6:30pm. All women are invited to join our Ladies Bible Study which meets on Thursday mornings from 8:30-10:00 a.m. in Luther Hall. This study will continue into June with a new study beginning in July.